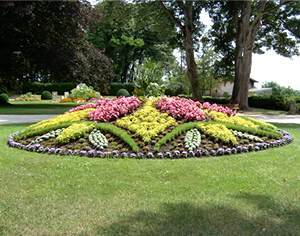 Bourbonne Les Bains Castle Park : In the heart of the thermale town, Bourbonne-les-Bains offers you a walk in the paths of its park. Fitted out in the XVIIIth century, it is offered to the city by Chevandier de Valdrome in recognition of the benefactions of his thermal waters. Dominating the valley of Apance, you will promenade in the middle of hundred-years-old trees, of a small formal garden, of massifs of mosaicultures furnish with achyranx, with echeveria and with big floral massifs in the more natural aspect. In the course of your stroll, you will take time to discover a green site, welcoming the city hall, the museum, the media library and the music school in the former buildings and the outbuildings rehabilitated by the medieval castle today disappeared.